Do you remember your first stage dive? You were, what, maybe 15 or 16, it was the mid-'90s, maybe the Smashing Pumpkins were playing Lollapalooza? Well, old-timer, this kid has got you beat. 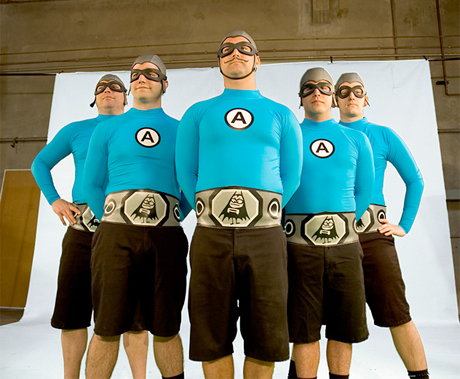 At an Aquabats gig in St. Louis, MO last night (November 14), vocalist MC Bat Commander reportedly plucked a small child out of the crowd before hoisting him up above his head and hurling him into the crowd. The kid, who might actually be donning the same sort of superhero garb the ska punk band were wearing, managed to tuck and roll across the throng like an expert. The clown that dove into the crowd just seconds after the tot did, however, need to brush up on his punk rock etiquette. That could have been a messy collision, considering dude had well over 100 pounds on the little rebel. See it all go down in the YouTube clip below (head to the 1:20 mark to see the littlest guy surf).